Hearts of Wulin is a roleplaying game of wuxia melodrama. Players take the role of skilled martial artists in a world of rival clans, conspiracies, and obligations. The game builds on the Apocalypse World engine, and is most strongly influenced by Monsterhearts 2, Masks, and The Veil. ​Hearts of Wulin emulates Chinese wuxia TV series like Proud Smiling Wanderer and Fox Volant of Snowy Mountain, Chinese martial arts novels from the second half of the twentieth century, and films like Crouching Tiger, Hidden Dragon. In these tales, romance is as dangerous as a blade. Everyone has ties to factions, loves they can’t quite express, and secrets which will shake them to their core. 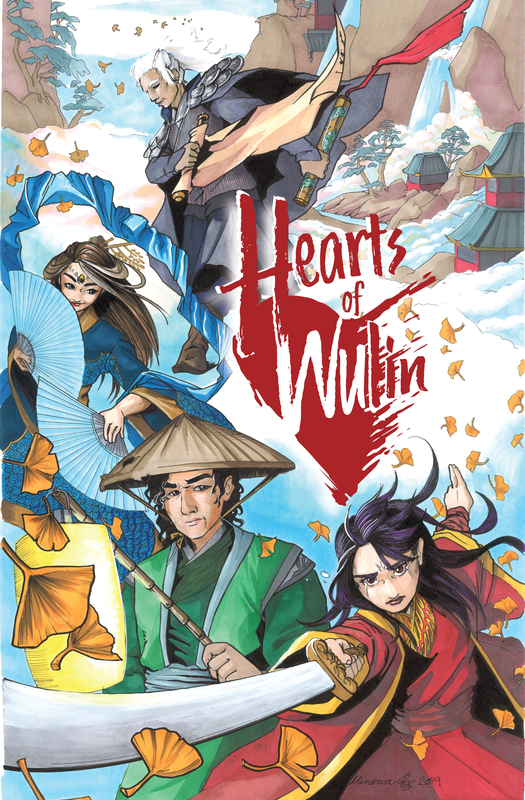 As in the source material, stories in Hearts of Wulin are driven by the characters’ duties, romantic desires, and entanglements with other characters. Hearts of Wulin is coming to Kickstarter in early May. To be notified when the campaign goes live, join our mailing list by clicking the button below. Hearts of Wulin is Powered by the Apocalypse (PbtA), meaning its mechanics are inspired, in part, by Apocalypse World by Vincent and Meguey Baker. The game is strongly influenced by several recent PbtA games, including Monsterhearts 2 by Avery Alder and The Veil by Fraser Simons. That said, Hearts of Wulin stands on its own, and has several distinct features that help players tell stories steeped in wuxia melodrama. Character creation involves choosing one of 6 broad playbooks. Each playbook has several archetypes available, to further define your character. For example, if you choose the Student playbook, your archetype choices are Hopeful Apprentice, Wandering Monk, or Younger Sibling. At the beginning of the game, you create a web of Entanglements, which are the emotional core of your story. The Inner Conflict move triggers when you come face-to-face with emotional turmoil related to an Entanglement. Will you keep yourself together, flee the scene, or worse? Ability scores in Hearts of Wulin are called elements, any one of which can be used during a dice roll, depending on how you approach the situation. For example, if you try to solve a problem with creativity or passion, you roll with the Fire element. If you approach the situation with patience or curiosity, you roll with the Wood element. But be careful: an element can be "marked" as the result of a poor roll, meaning your passion can turn to recklessness or your patience can turn to overconfidence. Combat in Hearts of Wulin is conversational in nature, as you would expect from the wuxia genre, and is resolved with a single, elegant die roll. Compare your scale to your opponent: if you are a higher scale, victory comes easy; if you are a lower scale, you'll need to train or find additional resources to defeat them. ​Playtest materials will be available soon! These materials give you everything you need to run a few sessions of the game. WATCH THIS SPACE. If you have played Hearts of Wulin or read through the playtest materials and would like to give the authors some feedback, or if you'd simply like to discuss the game, head over to The Gauntlet Forums by clicking the button below. You can also give feedback via the mailing list form at the top of the page. Lowell is the co-author of Hearts of Wulin. He co-hosts The Guantlet Podcast and records multiple Gauntlet Hangouts rpg sessions each week. His blog, Age of Ravens, won the Silver ENnie for Best Blog in 2017 and is now part of The Gauntlet Blog. He has worked on comics including Mouse Guard: Legends of the Guard and DC Comics's Flashpoint: Project Superman. He knows Laughing in the Wind isn't the best wuxia TV drama, but he loves it the most. Agatha Cheng is the co-author and cultural consultant for Hearts of Wulin. Outside of furiously researching for this game, she is a writer, cultural consultant, and co-host of the Asians Represent podcast. She loves story games, Chinese web-novels, and dark chocolate. Minerva Fox is the illustrator for Hearts of Wulin and is drawn to the fantastical and high-drama of the wuxia genre. Influenced by manga and western comics alike, she enjoys using ink and marker to bring hers and other people’s ideas to life. You can find her work in Codex, a monthly zine by The Gauntlet, Vigor RPG, and Dino Wranglers. In addition, you can watch her process live on Twitch on Mondays and Thursdays (@blue_troller).